Spotted turtles are threatened in Northeast Ohio. The Splash Fund has spent the last 6 years working with the Wild4Ever Foundation and numerous other environmental and educational agencies across the region to boost the number of little turtles with the distinctive yellow spots in the wild. In 2018, Terrestrial Brewing Company championed those efforts with a special beer—“I Love It When I Save the Turtles Porter.” Although not overly sweet, the chocolatey caramel-and-pecan porter with a hint of coffee was modeled after the decadent dessert “turtle” confection. 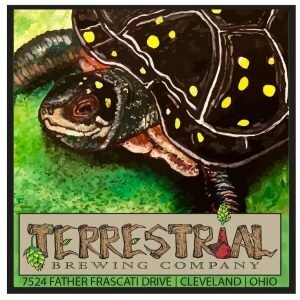 When the porter is on tap Terrestrial donates $1 from every pint sold to support the Splash Fund’s spotted turtle initiative. With Splash Fund and Wild4Ever Foundation donations, the Greater Cleveland Aquarium currently is rearing ten spotted turtles in quarantine, some of which are likely candidates for a 2019 release at a remote, protected Northeast Ohio habitat. It will be the Aquarium’s second cohort of spotted turtle hatchlings released to the site, and they will be microchipped and monitored by radio transmitter. The Splash Fund’s mission is to promote and encourage passion about aquatic life and participation in the conservation of fresh and salt water habitats through sustainable human practices. © Copyright 2018 Splash Fund of the Greater Cleveland Aquarium All rights reserved.